Sandvik UH440i Crusher. Made By : Conrad. Year Produced. Conrad - Construction Workers - 1:50th. New In Box. Terex IBH TS14B Scraper. Made By : Conrad. Length: 12". Width: 3 1/2". Scale : 1/40. Case 580D Loader Backhoe. Center Pivot Backhoe. Made By : Conrad. Scale : 1/35. Old Case Color - Orange & Black. Condition: Good Used In Box. Functions & Features Height: 3" (76mm). This is a very nicely detailed Model of a Tadano ATF 160G-5 All Terrain 200 ton Crane that was made Conrad in Germany and features many fine parts. The Cab is loose fits fine. Superb model and paint, new in box. Suitable for 027, O, or Super O layouts or high-end collector, museum quality historical truck and newest release. 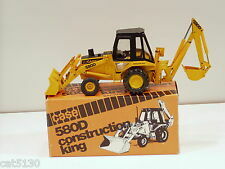 1/50 scale marked clearly on heavy duty box, highest quality associated with Conrad models. Caterpillar 789B Dump Truck - Launch Edition" SN# 0691. Made By : Conrad. Terex (GM) TS-14B Scraper Model. 1:40 Scale. Very nice condition. See the photos. the only issue is the grate is broken as shown in the pictures. 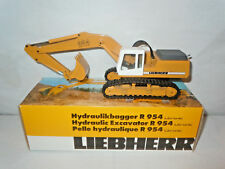 The Conrad Models 1/50 scale diecast model replica Industrial Cat Crawler Dozer With Impact Ripper is used, previous owner, item is in very good condition, With original box, the box has some fading. This model is the official launch edition No. 01397 of 5000 models, comes with collectors card. Item is very good, no damage, displays beautiful! Ground Shipping in the US is 16.00. International orders use the eBay Shipping program. Thanks for Looking! Wirth B3S Drill Rig. Made By : Conrad. Condition: Near Mint In Box. 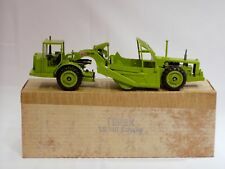 Conrad Komatsu Haulpak 1/50 scale die cast dump truck, in excellent condition. Vintage Sennebogen 5500 Star Lifter Lattice Boom Crane 1:50 CONRAD NIB rare! Up for sale is an Original Sennebogen 5500 Star Lifter Crane. Made by Conrad. Excellent Condition with light wear on the box. CONRAD 69105/01 - INTERNATIONAL 7000i DUMP TRUCK - 1/50 - "NEW IN BOX"
CONRAD 69105/01 - INTERNATIONAL 7000i DUMP TRUCK - 1/50 - "NEW IN BOX".… Very nice model from Conrad in the International series. This 7000i is sharp looking with a functional dump bed with a tailgate that opens as well as adjustable steering. It is pre-owned but in good condition. The articulating bed has one of the hydraulic rams that has snapped off. It is missing and not included. In great condition no issues.We ship as soon as payment is made. 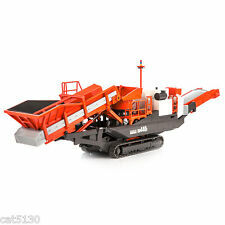 CONRAD BALLAST BOX with CRANE "MAMMOET" 1:50 "NEW" GREAT ACCESSORY. This is a wonderful accessory from CONRAD and an extra from the manufacturer for the Actros SLT in the Mammoet series. Even has a removable lid to protect your rigging. Large die cast metal truck, truck shows some tiny chips, excellent condition with original box, 9 1/2 inches long We sell a wide variety of vintage and antique toys including toys from the 1930's, 1940's, 1950's, 1960's, 1970's and 1980's. We have one of the largest antique toy stores on eBay so please be sure to check out our store to find that must have item that you have been missing from your collection. We are constantly purchasing new items from collections, estate sales, auctions, flea markets, etc. so be sure to check back often if you do not see the item you are looking for. Please feel free to contact us with any questions that you may have. We strive to ship quickly and securely. Combined shipping is always available. Check my other auctions for other items to add to your order. Shipping Worldwide. Caterpillar 583 Pipelayer. Made By : Conrad. Limited Edition. Functions & Features . Terex GM TS14B Scraper. Made By : Conrad. Length: 12". Width: 3 1/2". Scale : 1/40.